I was wondering how I put over 18 years into one page? I guess I’ll just let my mind turn the pages of each year Homer was part of our lives, and share with you the moments that made him Homer. In 1999, I’d just purchased a house, 5 acres, erected the first habitats and was beginning the sanctuary. I always knew I wouldn’t have to search for animals in need, they’d find us. 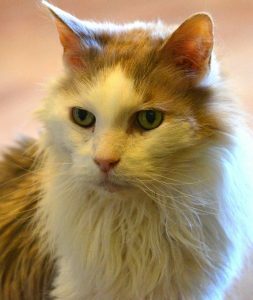 But I was surprised that one of the first arrivals was a gray and white, long hair domestic cat that appeared in the yard just days after we moved in. We named him Homer, since he came with our home. It was obvious Homer was an outdoor cat. He was an avid hunter and gatherer. We often found him up in a tree and just a few days out of the week at the front door with a prize for us. He never wanted to come in, but insisted we bring him food and a bed on the front porch. The 5 acres was located on a dead end. The road coming in was known as the “bad side of town.” That’s probably why I could afford it. It was intimidating on the nights I was alone. One night, the alarm went off, but I couldn’t figure out what triggered it. Alone, I was scared and locked all the doors. And of course, that was at the exact same time Homer appeared at the front door demanding a meal. You never said no to Homer. So, I opened the door as quickly as possible and pulled him inside, locking the door again. From that moment forward, Homer was an indoor cat. And it was my turn to demand something from him – being my security blanket and sleeping with me that night to ease my fear. A few years later, I made the decision to move myself and the sanctuary’s 10 wild cats to Minnesota to be near my family. I rented a cargo airplane named the Kitty Hawk to move the cats. Massive transport crates housing lynx, cougars and servals lined the airplane. And in the middle, was a tiny crate for Homer. True to form, he was brave and didn’t mind his intimidating neighbors for the trip. 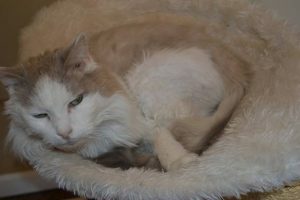 Over the years, Homer was a daily part of the sanctuary. He saw new cats come and beloved cats pass. He lived in bungalows with Bengals when he wanted to be outdoors. He lived in the overnight quarters inside, cuddling up to staff. Homer was popular with the volunteers, too. I think he had more fans than any big cat here at the Sanctuary! Homer was a friend to all. The only way to describe Homer is that he was Homer. He was easy going, went with the flow, but was never a push over. He got exactly what he wanted and was a pretty good manipulator to make us believe it was our idea. He could even turn his biggest critics, like ShyBear the Bengal, into a fan. It took over 6 months, but ShyBear finally realized she loved Homer. I don’t know how old Homer was the first time he chose us, but he wasn’t a kitten. He had thick, angora fur and over the years he became as plump and fluffy as Remoh. 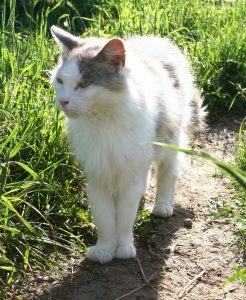 Later in his life, Homer’s coat thinned, he lost weight and marched in small steps due to his arthritis. But as soon as you looked in his eyes, it was still Homer. He had no idea his body had aged, and still demanded the same respect. He’d walk across the keyboard, sit and put his paws on your hand, preventing you from further work. This meant it was meal time. And when it was time for the staff to eat lunch, Homer made sure he was always in the center of the table. If he didn’t get a treat, he’d swipe as you brought your sandwich to your mouth – and would always come out the winner. If that didn’t work, he’d pull your plate towards him. He was always determined. So, near the end, when he was picky with food, we knew his body was failing. He was given so many kinds of food and treats. Whatever his heart desired. That worked for a while, but then he lost his appetite, even for that. On his last day, he was surrounded by staff and longtime volunteers and true to Homer, he rallied. He got up and did his power walk around the office. He ate every treat handed to him. He relished the hugs and kisses. But we knew he wouldn’t be able to rally again. 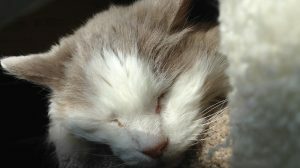 And after over 18 years of hard work at the sanctuary welcoming new residents, assisting office staff, being a confidant to staff and volunteers, it was time to let Homer be free and rest. He’d done such a good job being there for all of us. Now, it was time to be there for him and set him free. Homer, you weren’t just my cat, you were everyone’s cat. You had the amazing gift and determination to be a friend for all. You did it without ever losing sight of yourself. Thank you, my friend, for being you. You will be deeply missed. 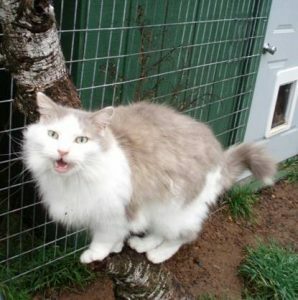 Homer, a longhair domestic cat, was a stray at our first property and we couldn’t bear to leave him behind. He was born in 1998 and showed up a year later to stay with TWS. His life now is drastically different and this little guy loves every minute of it. He lives in the office with Tara and Cooper. Homer is definitely the boss of the office cats and demands attention from the interns and the staff. He likes to peruse the table during any mealtime and with luck may even sneak a snack if someone looks away. He likes to spend his days sleeping with occasional bouts of play wrestling with friends. Being an older cat, Homer has arthritis. He receives several rounds of laser therapy a month which keeps him active and pain-free. 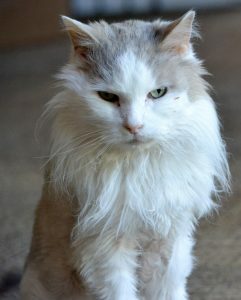 You can help provide daily care for Homer by sponsoring him today. Your help will be greatly appreciated.